Not having traveled with children in the park for a great many years, I learned a couple of things new to me that might be useful for other parents and grandparents to know about. Stuffed animal toys that Xanterra places in hotel rooms and that I have always pushed out of the way to make room for my own stuff are—not surprisingly—a magnet for little ones. My granddaughter Lexi ended the visit the proud owner of a cuddly bison and an even cuddlier black bear! Be forewarned that the hotels no longer provide cots in your room for kids. But they are happy to loan you some bedding, so we made nests for Lexi on the floor—and she was out like a light in two minutes each night after crawling in with her animals. One of our most delightful shared experiences was our geyser day at Upper Geyser Basin. 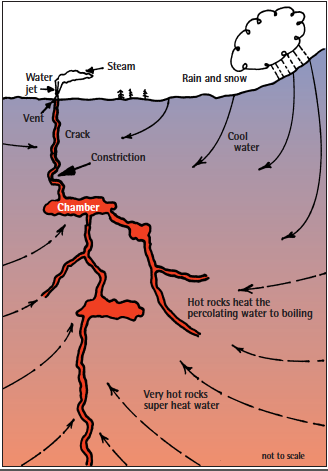 Starting by going to the Old Faithful Visitor Education Center at 8:00 am to copy down the predictions for six major geysers, we set out after breakfast to catch the Grand Geyser eruption, predicted to erupt within about one-and-one-half hours of 10:40 am. Lexi did not complain at all about the wait, and when Grand accommodated us at 11:20 (above) and again with a second beautiful burst at 11:37, she was every bit as thrilled as the other hundred or so visitors watching it. We went on to visit the wonderful pools and formations beyond Grand and were just in time to catch the Riverside Geyser eruption a little after 1:00 pm. Then our party split into two, and, fortuitously, Suzanne, David, and I caught Grotto Fountain and Grotto Geysers erupting on our way to see Punch Bowl Spring and Black Sand Pool. 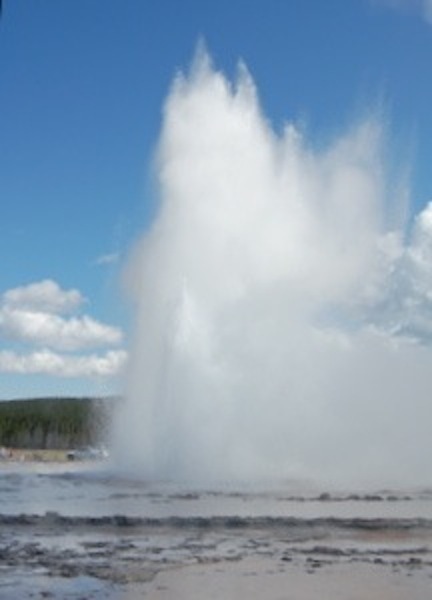 Returning from that extension of the trail, there was Daisy Geyser erupting as we came back to it! Not to be outdone, Beehive’s Indicator was going before we got back to the Inn, and we were able to see the whole Beehive Geyser eruption. Then, for “dessert,” Old Faithful joined the display not long afterwards. What a geyser day! My routine whenever I’m at Old Faithful Village is to go to the Visitor Center when it opens at 8:00 am to check out the geyser predictions for the day. Last month I was able to catch most of my favorites—except Grand and also Fan and Mortar eluded me. I was especially lucky to see two Beehive eruptions from the start, because before I was there and now after my visit, Beehive’s indicator is taking over. The indicator is a small geyser located next to Beehive’s large cone, and it commonly spouts a few feet for 10 to 30 minutes before Beehive’s incredibly powerful straight, high eruption. Now the indicator is going off every few hours and Beehive rarely. With a little patience I was able to see a lovely Fountain Geyser eruption (at Fountain Paint Pots) and two Great Fountains. 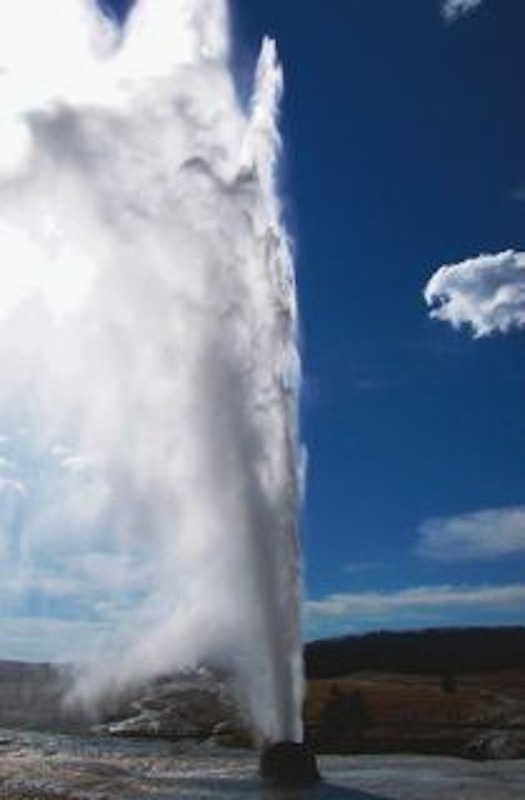 Unfortunately, the invaluable Lynn Stephens is no longer monitoring Great Fountain; for the past several years she has stayed in that geyser’s parking lot and noted when the overflow began, so that the prediction window could be narrowed, making the wait for the eruption much shorter. Due to an unexplainable fiasco with the National Park Service, her volunteer services have been terminated. She is sorely missed by geyser watchers. However, this summer we did have an apprentice of Lynn’s, Maureen from West Yellowstone, who has been able to watch the overflow quite often and help those of us with less time than we’d like to have see the eruptions. Walking out beyond Grand Geyser one day I noted that Chromatic Pool was more colorful (because hotter) than its neighbor, Beauty Pool. At Biscuit Basin, the three pools as you enter there seemed to me the hottest I’ve ever seen them, and the perpetual spouter (new in 2006) near the river continues to play. The most beautiful pools I saw this year were at Midway Geyser Basin. Besides the ever-incredible Grand Prismatic Spring, its neighbors Turquoise and Opal pools were outstanding. I believe Opal erupted a few days after I was there. So the park is never the same on two visits, but it never fails to delight me!